When your season ends, do you kick back, relax and get away from the game for a couple months? Of course not. Whether it’s formulating and implementing an off-season strength and conditioning program, ushering in a new group of players and preparing them for the following season or putting together motivational exercises, every successful coach knows that winter presents an opportunity for physical and mental team building. What are your priorities for your football program during the winter? B. Develop kids from a strength and speed standpoint. C. Develop leadership within the program. Harshman: Our priorities really don’t change much throughout the year. We run 4 short cycles every semester and focus on our core lifts of squat, power clean, dead lift, and bench press. During these months, though, we do add gymnastics and self defense (combatives) in the wrestling room. Westerberg: Our key focus is gaining strength and building mental toughness. It starts in January (we have played into late December the last 3 years) and goes through mid-March. Nicewarner: We spend the first three months of off-season workouts building mass. We use a low rep-high weight formula on four core lifts; bench, incline, squat, and power cleans. Our auxiliary lifts are a heavy dose of dumbbells and working on flexibility (hips especially). We also spend a lot of time developing the neck and shoulders (concussion prevention). I always try to get our athletes to understand the weight room is as much about injury prevention as it is getting bigger, faster, stronger. Roth: Whether our season ends late November or early December, it is my goal for the players to get away from football until school resumes in January. In January we set up workout schedules for our players. Nobody is excused from lifting in the off season so it is important for the two and three-sport athletes to have workout times that do not interfere with their spring sports. We emphasize that you can play as many sports as you want but you also need to be in the weight room. Streiff: My goals for the off season time are building size on the older kids and flexibility as well as joint strengthening in our younger players. How critical is your off-season strength and conditioning program? Joseph: We would not have a program at Katy High school without an offseason. We emphasize the need to improve as an overall athlete. Getting better as an athlete should help you become a better football player. Practicing football makes a better football player. Harshman: It is one of the foundations or cornerstones of our program. We lift year-round and are trying to get stronger and with that we will get faster. Nicewarner: My famous saying is that championships are won January through July. Results will speak for themselves. I have found there are far more success stories of players who dedicate themselves in the weight room succeeding on the field than those who don’t. We are a power run team, so strength is of the upmost importance to us. However, we do spend a significant amount of time on foot speed. I am a firm believer that speed is hereditary but it never hurts to be a step faster than you used to be. We will use the dot pads, speed ladders, and cone drills throughout the entire off season. Roth: I believe your team chemistry forms in the off season, in the weight room and doing agilities. My main focus in the off season is strength, gaining or losing weight, and building body mass. When do you test your players to see their progress? Do you compare from previous seasons? Joseph: We test our players at the beginning of off season, after 6 weeks, and before Spring Training. We compare from test to test from year to year. Also, we test by position every year. Harshman: We test our entire team every four weeks. We do not use any comparison data from previous seasons. Westerburg: We test at the beginning and then at the end. We have individual testing in the middle on specific lifts. We track their progress throughout their career. Nicewarner: We test our players every four weeks (12 workouts). I spend an entire week for testing, but still keep up our auxiliary workouts. Starting in January, we lift lightly and teach technique for about three weeks and then will max out for a baseline. Then we start our 12 workout cycle using low reps with heavy percentages. After about three cycles (max outs), we switch over to a high rep with low percentage workout. Recently, with technology, I have the results of past years at my fingertips so I’ve used it to show progress from previous years. I would highly recommend using an iPad or tablet to record your data. Roth: We test our players normally after an eight week cycle, depending where Mardi Gras and Easter holidays fall. We grade each cycle comparing their progress from the last lifting period. Streiff: We test every nine weeks in our class. When and how do you evaluate your assistant coaches? Is there a procedure in place? Joseph: The assistants are evaluated at the end of the football season and finalized at the end of year. 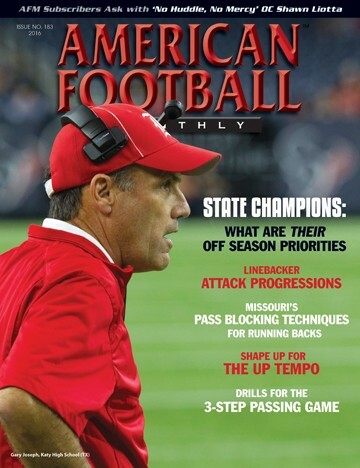 There is a KISD system in place, and a Katy High School Football evaluation done. Westerburg: I have a one on one meeting with each of them at the end of the year. This usually occurs in December or January. Nicewarner: I am extremely fortunate to coach with guys who I call my friends. They are very knowledgeable and professional men who take coaching very seriously. Five of my eight coaches are alumni of Bridgeport High School and its football team. As for evaluation, it is very informal. If I don’t think a coach is up to the task or isn’t doing the job I want them to do then I will tell them. My staff are professionals first and friends second. The assistants are there to coach and that is what I allow them to do. I do not micro-manage them as long as what needs to be accomplished is getting done. Streiff: I do not have a set procedure I follow for evaluation. I need to be better at this. My staff has been together a long time so we all know what is expected. I do have conversations with our young coaches. Do you let your assistants evaluate you? Joseph: No. KISD Athletic Director and Katy High School principal do. All coaches are required to give written input, and are free to voice their opinions orally during evaluations. Harshman: The athletic director is my formal evaluator. Westerburg: One question I always ask them is what would they have done differently if they were in my position? I use that as a self-evaluation. We go to different clinics and colleges through the spring. Nicewarner: No! If they don’t like the way I am doing things then I encourage them to speak up (BEHIND CLOSED DOORS). I don’t claim to know everything about football and am more than open to different ideas and ways to do things, as long as there is an understanding to not argue or disagree in front of the players. Once we get in the office its fair game, but we never have disagreements out on the field (and my brother is my defensive coordinator so it’s tough sometimes). When do you meet with next year’s players? Is there a timeline in place as you get ready for spring practice? Joseph: We meet after determining test goals and expectations are laid out. Then each player that wants to be a captain for the following year goes through an interview process with me. Leadership and qualities of leadership are covered. Harshman: I see them daily throughout the year and there is a timeline for spring and summer activities. The biggest thing for us is to get our guys to be three sport athletes with a winter and spring sport. Westerburg: We have them year round so we meet every day. We start adding skills to offseason workouts in March and April to get ready for spring ball. We have 30 days to get in 18 practices. Nicewarner: We never formally meet. The players know when lifting starts and are expected to be there when they can be. We have a small school and have many multiple sport athletes. Unfortunately, we don’t have spring ball, but do have a three week period in June when we can work with our players. We encourage our players to participate and vary practice times to accommodate other sports and work schedules. Roth: I do not formally sit down with each player, but I am the kind of coach who is constantly among the players. So, sometime in early spring I informally let them know what my expectations are of each one of them in the upcoming season. What about talking with parents? Do you meet with them to outline the coming months? Joseph: I meet with all senior parents at the conclusion of spring training. I discuss how each coach has done a comprehensive written evaluation of their son, their projected role, how much playing time can be expected and where they are on the depth chart. Harshman: We just meet in the fall and have not had spring meetings in the past. I give the information to our kids and they take it home. In addition we have a website, facebook, and twitter account to get the word out. Westerburg: I don’t meet with the parents. I have been at this school 12 years so most know the schedule and expectations. I will meet with the incoming ninth grade parents in the spring. Nicewarner: We have a few events over the summer months to get the parents involved with the program. We have “senior moms” who generally run the show during the season for a Thursday spaghetti dinners, post game meals and any sign making, pep club activities. My only message to them is everything has to be TEAM oriented. There are no varsity only or senior only activities. We do everything as a team or we do nothing. I also have an end of off season/beginning of football season picnic that allows me to outline the upcoming season and what to expect. Roth: I have a parent /player jambalaya dinner in early August to inform both players and parents as to what is to be expected of them. Each player receives a handbook and a team contract in which they and their parents must sign. In it, we cover every topic but playing time. Streiff: We have a call out meeting in mid-April with returning parents and then with incoming freshmen. We give an overview of the program, summer expectations and calendar, and then our parent organization addresses the team. What assistance do you give to graduating seniors that want to play at the next level? 1. Scholarships and what has to be done before their senior year. A. We can only recommend. B. Difficult to play at next level. C. College coaches – evaluate and decide. D. Recruiting services – be careful. 2. When taking the ACT or SAT, request test scores to be sent to the eligibility center. 3. Complete amateurism questionnaire and sign the final authorization signature online on or after April 1 if you are expecting to enroll in college in the fall semester. (If you are expecting to enroll for the spring semester, sign the final authorization signature on or after October 1 of the year prior to enrollment). 4. Have your high school guidance counselor send a final transcript with proof of graduation to the eligibility center. 5. Questionnaires are sent in and list given to college coaches. 6. Unofficial transcripts are made ready for coaches. 7. Hudl- highlights are made ready. Westerburg: We have a coach in charge of recruiting and academics that assists them on whatever they want to do. We sign on average 15 kids a year to play college football at all levels. Nicewarmer: In addition to filling out questionnaires from colleges, I encourage all my players to attend as many camps as they can. I am not a big combine guy, but do see the benefits. The greatest invention in football has been Hudl. The players can make their own highlight films and send them out to any school they want. I believe it has really changed the recruiting process and has made my job a lot easier. Roth: I give them an honest assessment at what level I think they can play in college, if at all. If they think they can play at a higher level I tell them to let the colleges be the judge of that. I will contact college coaches for them. I also tell them about making their own highlight tapes and what college coaches are looking for. Streiff: I help them connect with schools. I usually encourage those who want to play to find a school first and then, as coaches, we get football involved.